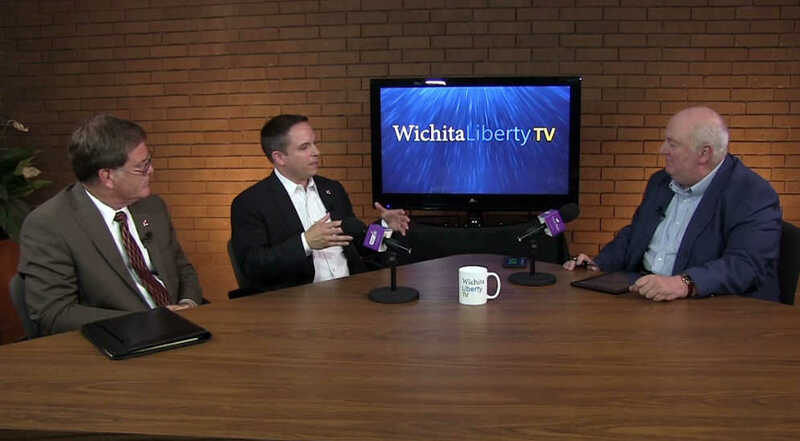 In this episode of WichitaLiberty.TV: A look at some elements of Wichita’s legislative agenda for state government, in particular special tax treatment for special artists, problems with the city’s numbers regarding airfares, and why we should abandon the pursuit of passenger rail. Then, why are people not more involved in political affairs? View below, or click here to view at YouTube. Episode 67, broadcast December 7, 2014. To pay for a new water supply, Wichita gives voters two choices and portrays one as exceptionally unwise. In creating this either-or fallacy, the city is effectively campaigning for the sales tax. 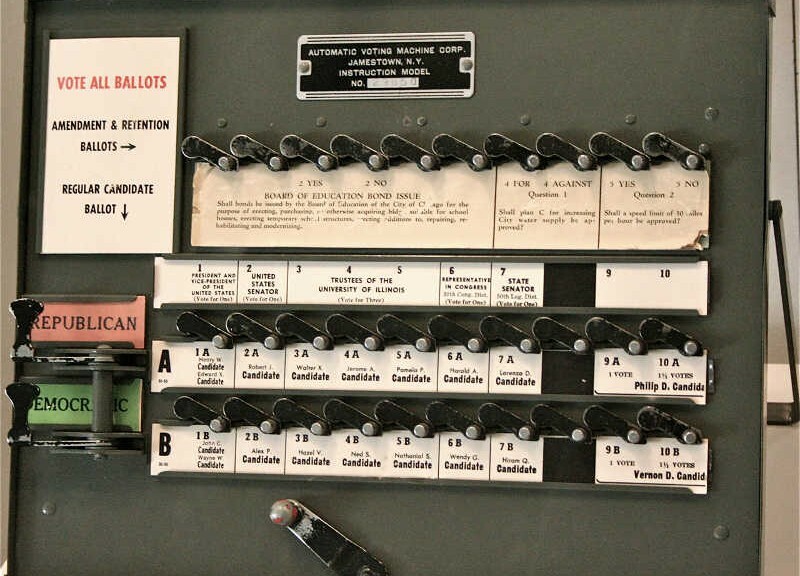 In November Wichita voters will decide whether to create a sales tax of one cent per dollar. The largest intended purpose of the funds is to create a new water supply. Set aside for a moment the question whether Wichita needs a new water source. Set aside the question of whether ASR is the best way to provide a new water source. What’s left is how to pay for it. To pay for a new water source, the city gives us two choices: Either (a) raise funds through the sales tax, or (b) borrow funds that Wichitans will pay back on their water bills, along with a pile of interest. As you can see in the nearby chart prepared by the city, the costs are either $250 million (sales tax) or $471 million (borrow and pay interest). The preference of the city is evident: Sales tax. The “Yes Wichita ” group agrees. Here’s what is happening. City hall gives us two choices. 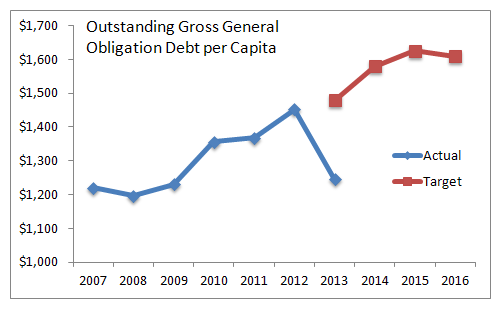 It’s either (a) do what we want (sales tax), or (b) we’ll do something that’s really bad (borrow and pay interest). Wichita voters shouldn’t settle for this array of choices. Let me emphasize that. 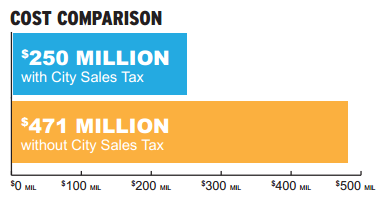 The city’s informational material says if voters don’t pass the sales tax, the city will do something unwise. But the city did that very same bad thing to pay for the current ASR project, that is, borrow money and pay interest. But now the city says pass the sales tax or we will do something bad to you. Pass the sales tax or the city will issue long-term debt and you will pay a lot of interest. 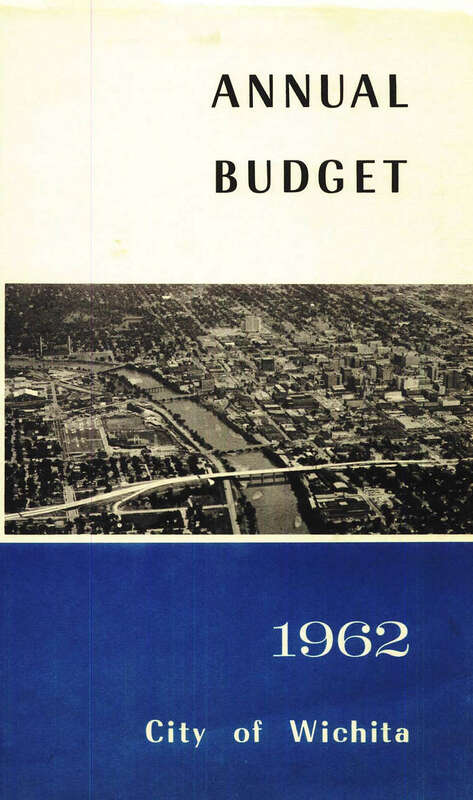 Pass the sales tax, or we will do again what we did to pay for the current ASR project. And that would be bad for you and the city. Are there other alternatives for raising $250 million for a new water source (assuming it is actually needed)? Of course there are. The best way would be to raise water bills by $250 million over five years. In this way, water users pay for the new water supply, and we avoid the long-term debt that city council members and “Yes Wichita” seem determined to avoid. Water bills would have to rise by quite a bit in order to raise $250 million over five years. The city could decide to raise rates by different amounts for different classes of water users. The city could adjust its tiered residential rate structure to be more in line with the average of other large cities. (See Wichita water rates seen as not encouraging conservation.) But the total cost of the higher water bills would be exactly the same as the cost of the sales tax: $250 million. It’s important to have water users pay for a new water supply. The benefit is that water users will become acutely aware of the costs of a new water supply. That awareness is difficult to achieve. Many citizens are surprised to learn that the city has spent $247 million over the past decade on a water project, the ASR program. Almost all of that was paid for with long-term debt, the same debt that the city now says is bad. Paying for a new water supply through water bills would let commercial and industrial users participate in paying the cost of the project. These water users usually don’t pay a lot of sales tax. A restaurant, for example, does not pay sales tax on the food ingredients it purchases. An aircraft manufacturer does not pay sales tax on the raw materials and component parts it buys. But these companies do have a water bill. Yet, the city recommends that low income households pay more sales tax on their groceries. The city says this is the best way to pay for a new water supply to protect our lawns and golf courses during a drought. As Wichita voters consider spending $250 million expanding a water project, we should look at the project’s history. So far, the ASR program has not performed near expectations, even after revising goals downward. In November Wichita voters will consider approval of a one cent per dollar sales tax. Of the $400 expected to be collected over five years, $250 million is earmarked for a new water source. The city has decided that the new water supply will be implemented through expansion of the Aquifer Storage and Recovery program or ASR. This is a program whereby water is taken from the Little Arkansas River, treated, and injected in the Equus Beds aquifer. That water is then available in the future as is other Equus Beds water. 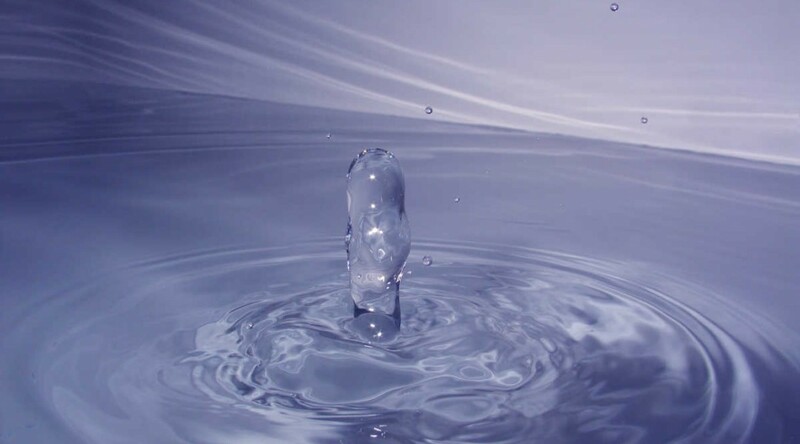 The city believes that ASR is a proven technology that will provide water and drought protection for many years and recommends that voters approve $250 million for its expansion, although there is possibility that the cost may be $200 million. According to city documents, the original capacity of the ASR phase II project to process water and pump it into the ground (the “recharge” process) was given as “Expected volume: 30 MGD for 120 days.” That translates to 3,600,000,000 (3.6 billion or 3,600 million) gallons per year. ASR phase II was completed in 2011. 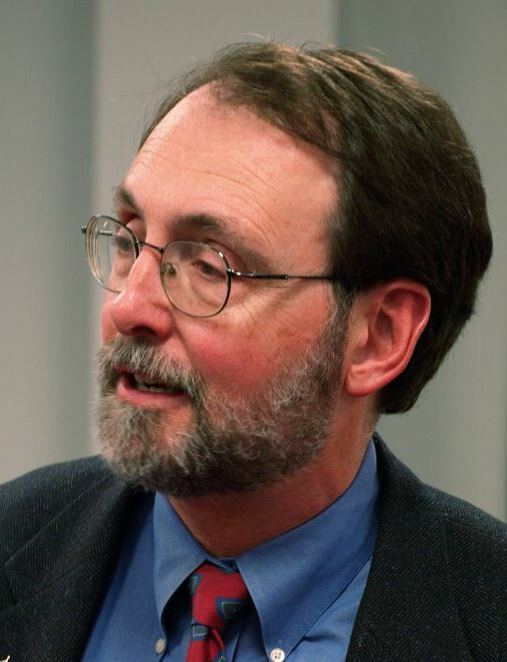 At a city council workshop in April 2014, Director of Public Works and Utilities Alan King briefed the council on the history of ASR, mentioning the original belief that ASR would recharge 11,000 acre feet of water per year. But he gave a new estimate for production, telling the council that “What we’re finding is, we’re thinking we’re going to actually get 5,800 acre feet. Somewhere close to half of the original estimates.” The new estimate translates to 1,889,935,800 (1.9 billion or 1,900 million) gallons per year. Based on experience, the city has produced a revised estimate of ASR production capability. What has been the actual experience of ASR? The U.S. Geological Survey has ASR figures available here. I’ve gathered the data and performed an analysis. In 2013 ASR recharged 366 million gallons, or 19 percent of the newly revised estimate of production capacity. In 2014 through September, ASR recharged 275 million gallons, or 14 percent of capacity. Extrapolating this nine months of production to a full year results in 367 million gallons produced for 2014, or 19 percent of capacity, the same value as in 2013. This may or may not be valid, but it gives an idea of how 2014 is proceeding. So for the two most recent years, the ASR system has not operated near its designed capacity, even after revising that capacity downwards by half. To place these production figures in context, the city uses 56 million gallons per day, on average. So the annual production of the ASR project is about 6.5 days of water usage. 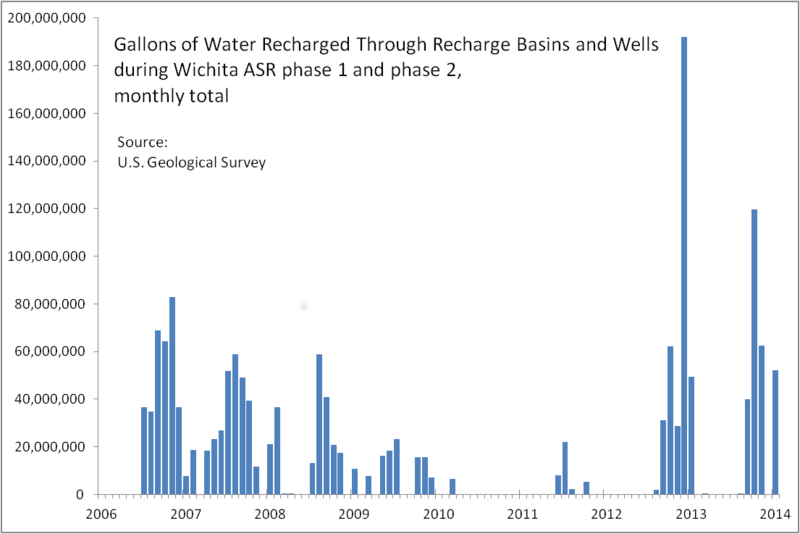 Gallons of Water Recharged Through Recharge Basins and Wells during Wichita ASR phase 1 and phase 2, monthly. Click for larger version. The ASR system is able to draw water from the river only when the flow is above a certain level, which is not every day of the year. So we may want to take a look at how the ASR system performs for shorter periods of time. Monthly data is available. For a 30-day month, if the plant could be run at full design capacity each day, the production would be 900,000,000 (900 million) gallons. The best month ever for actual production was 192 million gallons, with the second best at 120 million gallons. If we take the 12 best months for production, including before ASR Phase II started operations, the amount of water recharged is 924 million gallons. That’s 49 percent of the revised expected annual production of 1.9 billion gallons. 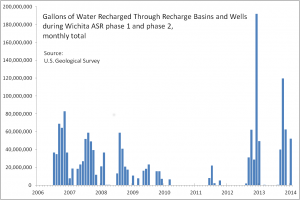 Gallons of Water Recharged Through Recharge Basins and Wells during Wichita ASR phase 2, cumulative. Click for larger version. 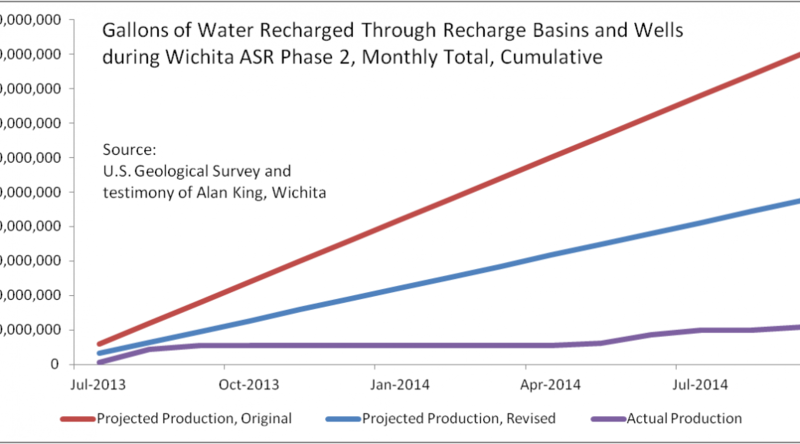 I’ve produced a chart of the cumulative production of the Wichita ASR project compared with the original projections and the lower revised projections. The lines for projections rise smoothly, although it is expected that actual production is not smooth. The second phase of ASR was completed sometime in 2011, but no water was produced and recharged that year. So I started this chart with January 2012. Data is from U.S. Geological Survey. 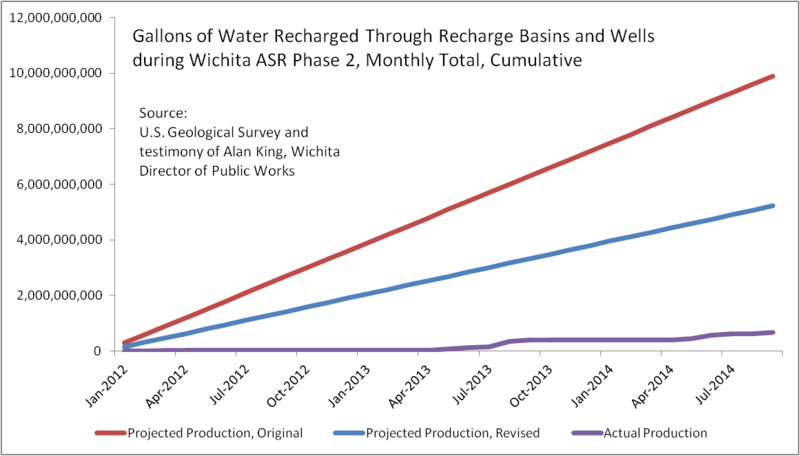 Gallons of Water Recharged Through Recharge Basins and Wells during Wichita ASR phase 2, cumulative from July 2013. Click for larger version. 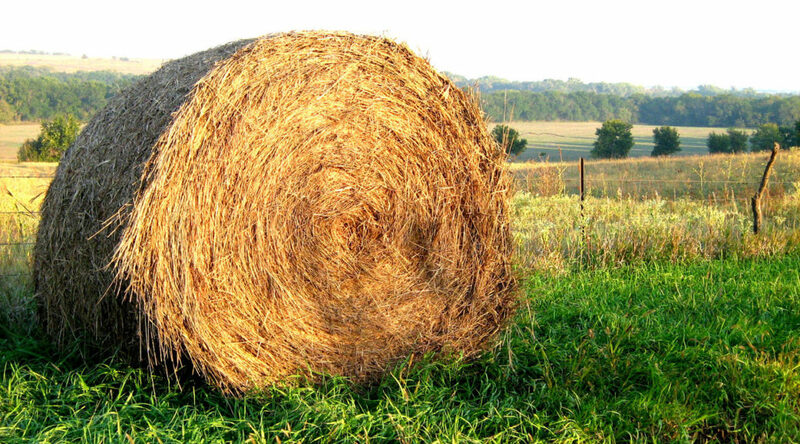 Some have said that since 2013 was a drought year, it isn’t fair to evaluate the production of ASR during a drought. So to present ASR in the best possible light, I’ve prepared a chart starting in July 2013. That was when it started raining so much we had floods, and data from USGS shows that the flow in the Little Arkansas River was much greater. Still, the ASR project is not keeping up with projections, even after goals were lowered. The city and the “Yes Wichita” campaign say the ASR project is proven and is working. The available data, however, does not support this claim. 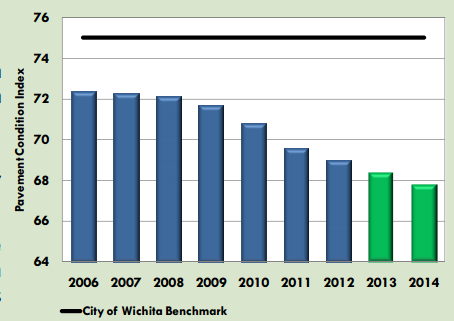 Wichita city hall promises policies that are clear, predictable and transparent, except when they’re not. But there’s a problem. It’s difficult for governments to establish policies that will satisfy everyone. How do we know today what we’ll need five or ten years down the road? When governments change policies to fit particular circumstances, taxpayers are rightfully concerned that the alterations are to suit the needs of special people — the cronies that feed from the city hall trough of taxpayer money. When you couple in what public choice theory tells us, which is that the cronies who want money from government have a much stronger motive to succeed than the bureaucrats are motivated to protect citizens and taxpayers, we can have trouble. This has happened before in Wichita. Last year when a project didn’t meet the (supposedly) required benefit-cost ratio, the city simply said that it didn’t apply in that case. 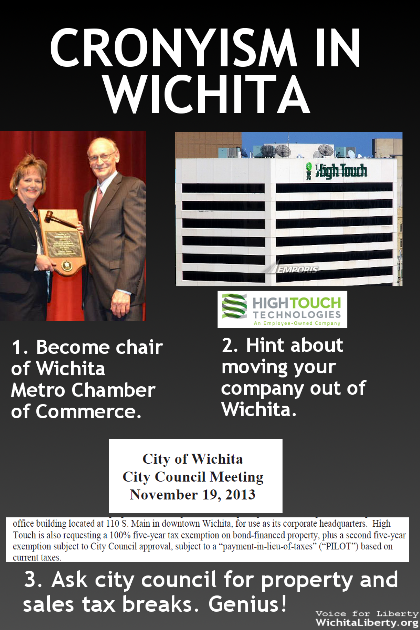 See Wichita’s policymaking on display. Now, Wichita seeks to modify its policies again in response to the wants and desires of one person. For this project we see that city policy is being modified on the fly to meet the circumstances of a particular project. This is not necessarily bad. Entrepreneurship demands flexibility. But the city promises policies that are clear, predictable and transparent, and city officials say Wichita has a transparent, open government. Can you imagine conscientious developers who want to invest in downtown Wichita, but after studying the city’s policies, realize their projects don’t conform to the city’s published standards? How many moved on to other cities, not realizing that our standards can be altered and waived? As Wichita voters consider the value to give to promises from city hall, they should consider these episodes when the city promises there will be “established policies” for the spending of economic development funds generated by the proposed sales tax. Do you get the feeling that Wichita’s promises and projections regarding water are quite, well, fluid? But now, Wichitans are told there is a water crises, and the way to solve it is by voting for a sales tax of one cent per dollar. Either that, or the city will meet the crisis by borrowing money and having water users pay an extra $221 million in interest on a $250 million project. Perhaps the city’s 2008 news release was based on overly-optimistic engineering. 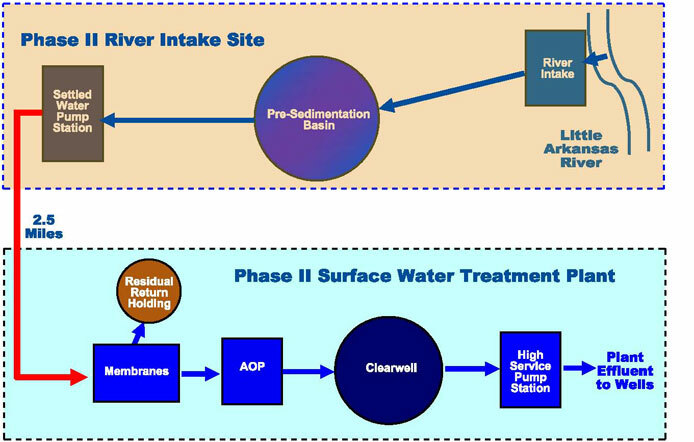 Perhaps the claim of being able to meet our water needs through 2050 is based on all four phases of ASR being completed. Do you get the feeling that the city’s promises and projections regarding water are quite, well, fluid? Do you remember that eleven years ago then-Mayor Bob Knight was told we had sufficient water for the next 50 years? An adequate water supply is vitally important. But we are not in a crisis. 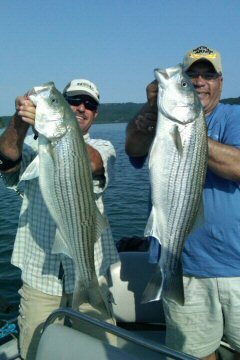 We had plenty of water this year. 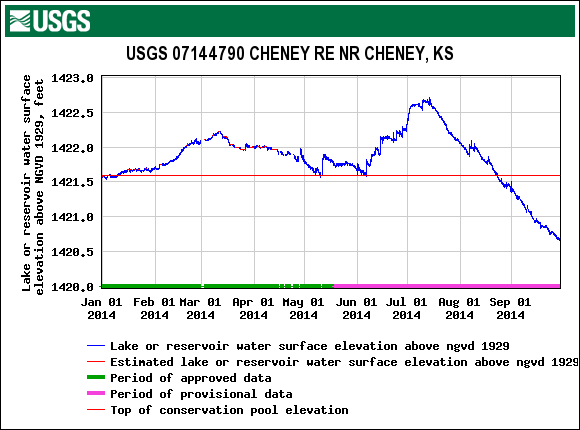 Cheney Reservoir has been full most of the year, although currently a little less than full as it’s been dry the last month or so. Wichita’s water crisis — to the extent it exists — does not need to be solved in a rush. The risks of making big-dollar mistakes are too high to hurry. Speaking of the ASR project: At a time of heightened interest in ASR, the project’s website has been abandoned. Readers will find language like Phase II “will be complete by the end of 2011.” The last newsletter was for December 2011. The first years of operation of Phase II of ASR have not been a total success. Maybe that’s why there’s been no news. It’s bad news that Wichita drivers will suffer through more years of delay as they travel through east Wichita. The value of the lost hours sitting in traffic? It’s impossible to say. It’s unclear how the redesign would affect the ongoing lawsuit between the city of Wichita and 10 property owners whose land was taken by eminent domain for the project. The city also has acquired another 30 parcels in the area. A court-appointed panel of three appraisers awarded the owners of the 10 parcels a collective $19.6 million for their properties in November. 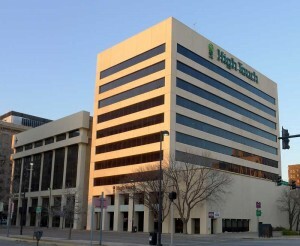 The Wichita City Council approved the award, as required by the court, but the amount far exceeded an internal estimate in the $4 million to $5 million range. In December, the city sued the landowners to see if a court would reduce the valuations. Some of that land probably would not be needed if the interchange is redesigned. Did you catch that? The city spent nearly five times as much as original estimates to seize property through eminent domain, and also purchased other property. Buildings with remaining useful life have been razed. Now, we learn that this land may not be needed. As Wichita city hall asks citizens to trust the plans for the proceeds of a new sales tax, remember lessons like this. 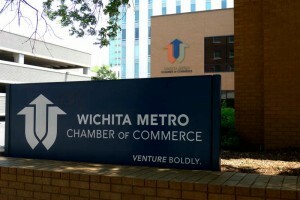 Wichita justifies its use of targeted economic development incentives by citing benefit-cost ratios that are computed for the city, county, school district, and state. If the ratio exceeds a threshold, the project is deemed worthy of investment. 1. The benefits in the calculation are not really benefits. Instead, they’re in the form of projected higher tax revenues collected by governments. This is very different from the profits that private sector companies earn from their customers in voluntary market transactions. 2. Even if government collects more tax by offering incentives, it should not be the goal of government to grow just for the sake of growing. 3. Government claims that in order to get these “benefits,” incentives are necessary. But often the new economic activity (relocation, expansion, etc.) would have happened without the incentives. 4. Why is it that most companies are able to grow without incentives, but only a few companies require incentives? What is special about these companies? Why do some companies receive incentives year after year? 5. If the relatively small investment the city makes in incentives is responsible for such wonderful outcomes in terms of jobs, why doesn’t the city do this more often? If the city has such power to create economic growth, why is anyone unemployed? 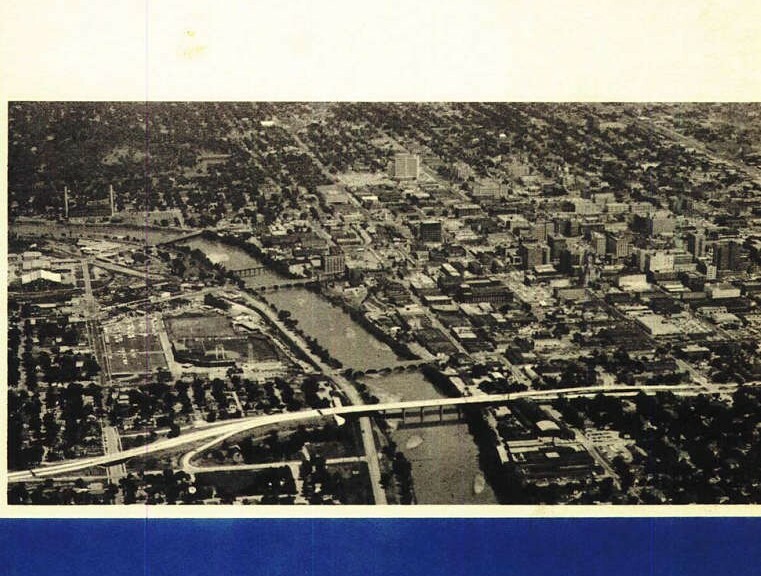 Development plan for downtown Wichita as prepared by RTKL Associates, Inc. January, 1989. View below, or click here to open in new window. The City of Wichita says it wants policies to be predictable and reliable, but finds it difficult to live up to that goal. From 2009, an example of how the City of Wichita makes policy on the fly to suit the current situation. The policy change benefited a building developed by “The Minnesota Guys,” who, since the time of this article, fell into disfavor with pretty much everyone in Wichita, including the city council. When the Lofts at St. Francis needed routine repairs, the city waived policies to use special assessment financing. Regarding public policy, this episode illustrated the city broadening the application of special assessment financing. Traditionally special assessment financing has been limited to instances such as the city building streets and sewers in new areas of town, allowing commercial and residential property owners to repay the costs over 15 years. But the item approved by the council at this meeting was for repair of existing buildings, not construction of new infrastructure. Additionally, the work financed by the special assessment taxes will be owned by the private property owners. When the city uses special assessment financing to build streets and sewers in new neighborhoods the city owns this infrastructure, even though it is paid for by nearby property owners. To approve this financing, the city had to bend or waive two policies. That’s problematic, as the city tells citizens it wants policies and council behavior to be consistent and predictable. Although this incident is from five years ago, not much has changed since then. See Wichita: No such document for an example from last year. Following is Wichita special assessments for repairs is bad policy. Other articles on this topic are In Wichita, waiving guidelines makes for bad policy and At Wichita city council, special pleading of selfish interests. 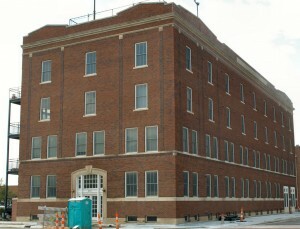 At Tuesday’s meeting (August 18, 2009) of the Wichita City Council, a privately-owned condominium association is seeking special assessment financing to make repairs to its building. 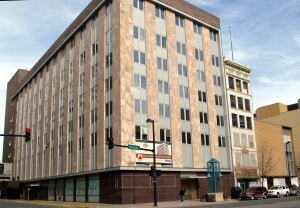 In order for the association to succeed in its request, the council will have to waive two guidelines of Wichita’s facade improvement program. 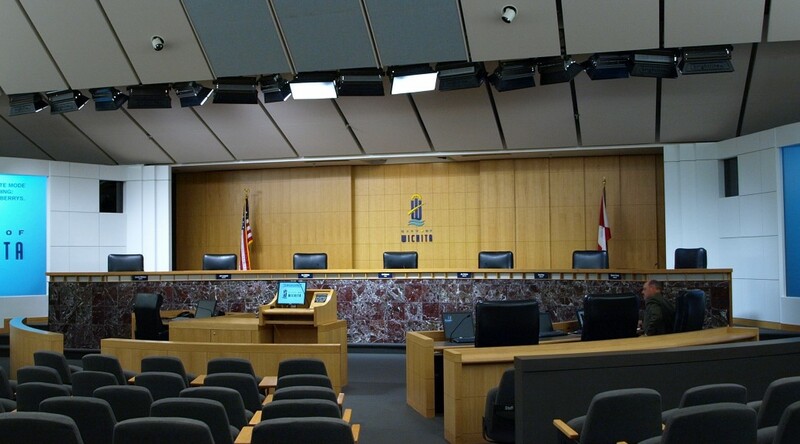 Now that the Wichita City Council has all but recommended that voters raise taxes in order to spend $250 million for water supply enhancements, citizens need to consider recent history and how current decisions are made. 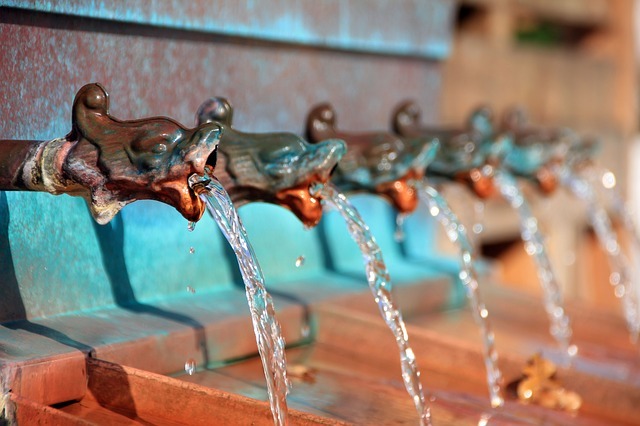 Through the Community Investments Plan process and by other means, citizens have told the City of Wichita they’re concerned about future water supply. Those who have been paying attention might be surprised that there is a water crisis. That’s because when Bob Knight was mayor, he was told that Wichita had sufficient water for the next 50 years. That was about eleven years ago. 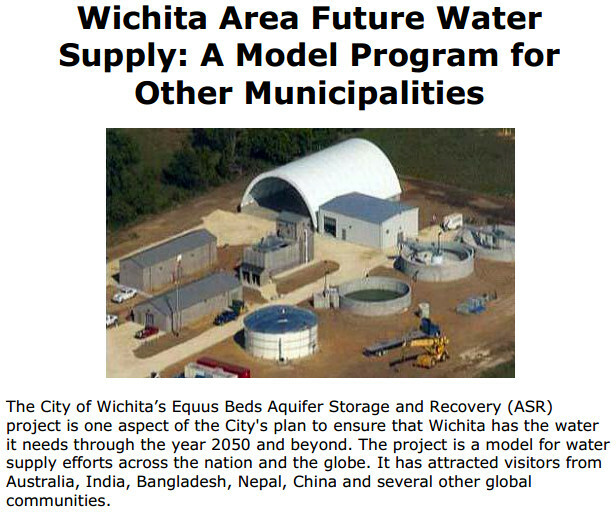 The project boasted of is the City of Wichita Aquifer Storage and Recovery Program or ASR. Its cost, so far for Phases I and II, is $247 million. 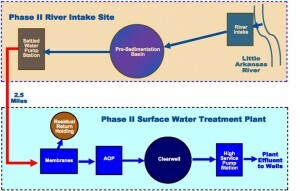 According to the document, two more phases are contemplated. It appears the plan the city council favors is to expand the ASR project at a cost of $250 million, thereby doubling the amount spent on this project. Some council members have noted the low utilization of the ASR and see its expansion as a way to wring greater efficiency from the plant. But this mode of thinking is not rational. What has been spent on the ASR is now properly classified as sunk costs. These are costs that have been spent and can’t be recovered. Sunk costs are not relevant to future decisions. Instead, the city needs to focus on the marginal improvements that can be made, and how to get the best value for these future costs. That’s the economic way of making decisions. But, of course, decisions on Wichita’s future water supply are being made in the political sphere. How did Wichita get in this position? Wichita officials — thanks to a couple of weeks of rain — said they were able this week to dodge possible water restrictions and punitive measures as a means of coping with the ongoing drought. 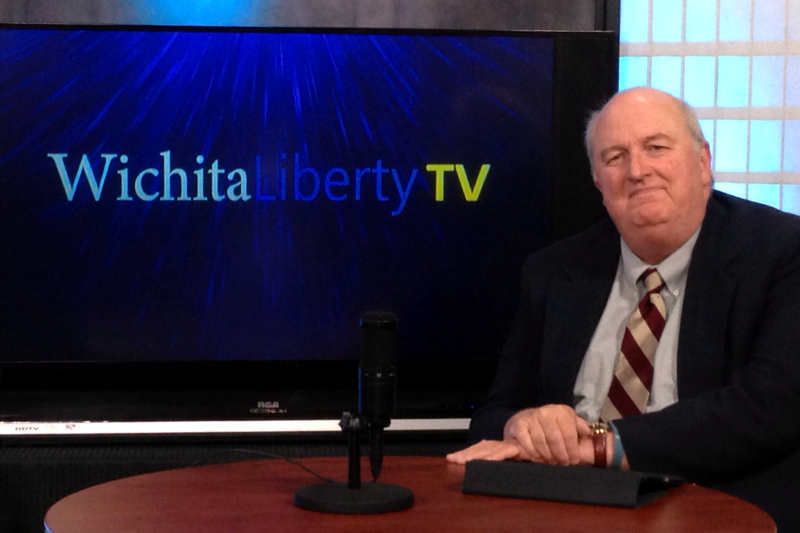 But Wichita developer Johnny Stevens voiced to me today something I have heard from others in the community recently. Stevens thinks poor leadership is to blame and can’t understand how elected officials ever let the community seemingly come so close to the edge of such a critical issue. He said long-term solutions are needed, but he also warns that they have to be made using solid data. Continue reading at Developer Johnny Stevens on water issue: How did it get to this? Long-term thinking: This is not characteristic of political leaders, whose time horizon rarely extends beyond the next election season. 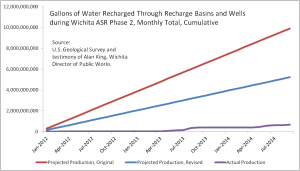 Are there other ways to secure water for Wichita? Is Wichita considering private-sector solutions? Wichita/Sedgwick County Community Investment Plan logo. In February the City of Wichita held a workshop where the Community Investments Plan Steering Committee delivered a progress report to the city council. The amounts of money involved are large, and portions represent deferred maintenance. That is, the city has not been taking care of the assets that taxpayers have paid for. When Wichita city leaders ask for more taxes to pay for this lack of stewardship, citizens need to ask for better accountability than what they’ve received. The time frame of this planning process is the period 2013 to 2035. Under the heading “Trends & Challenges” we find some troubling information. Wichita Mayor Carl Brewer hinted at the problem last year in his State of the City Address when he said the city would need to spend $2.1 billion over 30 years on maintenance and replacement of water and sewer systems. The city’s performance measure report also told us that our pavement condition index has been deteriorating, and is projected to continue to decline. The cost to remedy this lack of maintenance is substantial. The document says that on an annual basis, Wichita needs to spend $180 million on infrastructure depreciation/replacement costs. Currently the city spends $78 million on this, the presentation indicates. The “cost to bring existing deficient infrastructure up to standards” is given as an additional $45 to $55 million per year. The amounts by which the city is deficient in maintaining its assets is staggering, compared to other expenses the city has. The size of the deficiency overwhelms possible sources of new revenue. A one cent per dollar increase in sales tax would not cover the deficiencies in maintaining our current assets. Then, remember the things Wichita wants to increase spending on — a new library, economic development, expanded public transit, new convention center, economic development, and perhaps other things. It’s unclear how closely the findings from the public meetings reflects actual citizen preference. Cynics believe that these meetings are run in a way that produces a predetermined outcome aligned with what city officials want to hear. At any rate, when you ask people about their preferences, but there is no corresponding commitment to act on their proclaimed preferences, we have to wonder how genuine and reliable the results are. There is a very reliable way to find out what people really want, however. Just let them do it. If people want to live downtown on in an inner city neighborhood, fine. If they want suburban-style living, that’s fine too. Well, it should be fine. But reading between the lines of city documents you get the impression that city planners don’t think people should live in suburban-style settings. The meaning of an attractive investment climate means different things to different people. 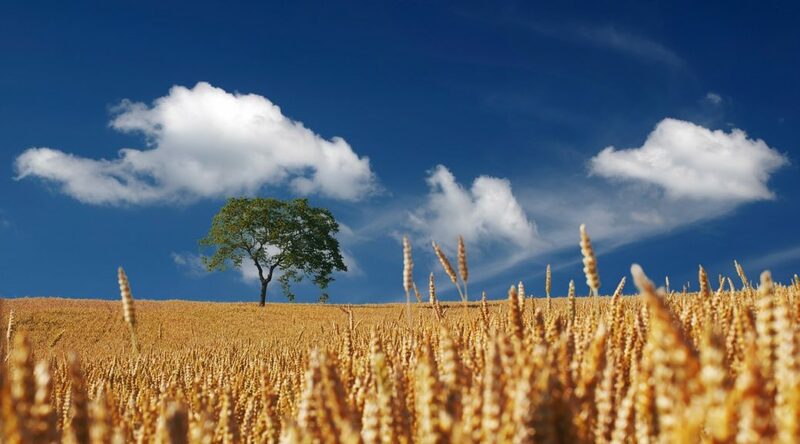 Some people want an investment climate where property rights are respected, where government refrains from meddling in the economy and transferring one person’s property to another. An environment free from cronyism, in other words. 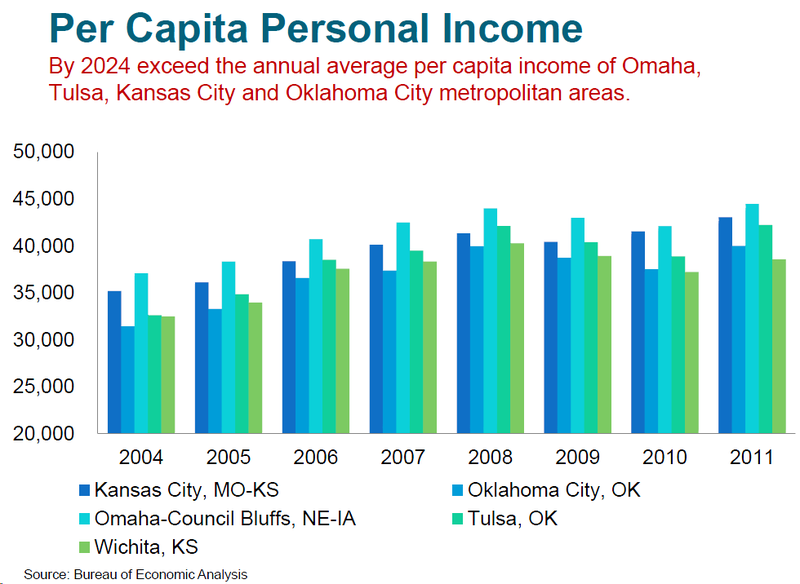 But the Wichita way is, unfortunately, cronyism, where government takes an active role in managing economic development. 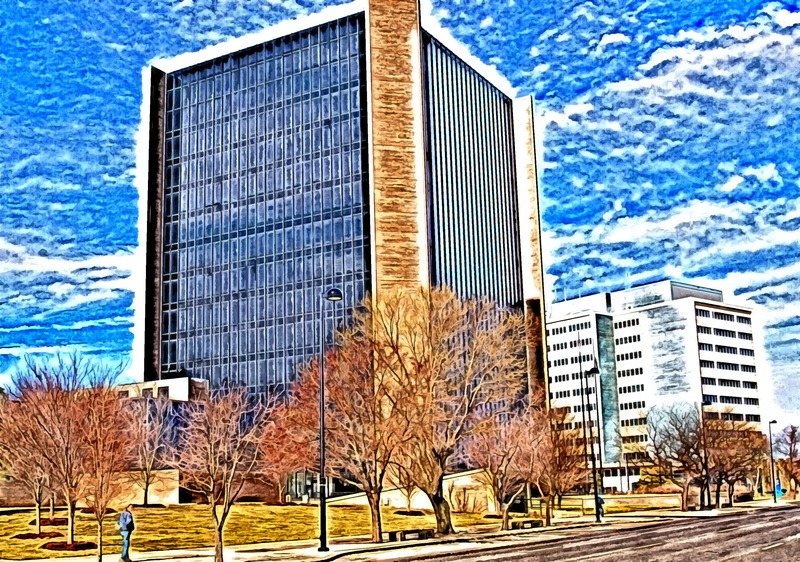 We in Wichita never know when our local government will take from us to give to politically-favored cronies, or when city hall will set up and subsidize a competitor to your business. Wichita flights compared to the nation. This is an example of a question which has a false premise. 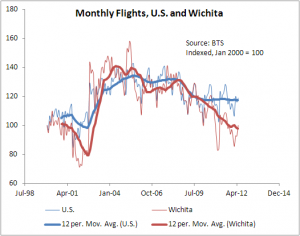 Since the subsidy programs have been in place, the number of flights from the Wichita airport has declined, not increased as the question would lead readers to believe. See Wichita flight options decrease, despite subsidies and Wichita airfare subsidy: The negative effects. It’s almost as if the mayor is speaking as a bystander. But he’s been mayor for nearly seven years, and was on the city council before that time. During that time, he and other city leaders have boasted of not increasing property taxes. While the property tax rate has been (fairly) stable, property tax revenue has increased due to development of new property and rising assessment values. Still, of this, the city has a huge backlog of deferred maintenance. The way to interpret this is that the city has really been engaging in deficit spending under Brewer’s leadership. We didn’t spend what was needed to maintain our assets, and now the mayor tells us we need to increase spending to make up for this. The economist Milton Friedman told us that it’s more important to look at government spending rather than the level of taxation. That’s because spending must eventually be paid for, either through current taxes or future taxation. The federal government generate deficits and can pay for spending through creating inflation. Fortunately, cities and states can’t do that. 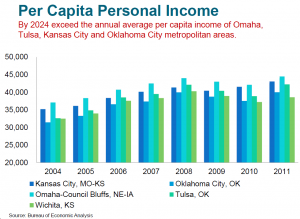 But, as we’ve seen, cities like Wichita can incur costs without paying for them. 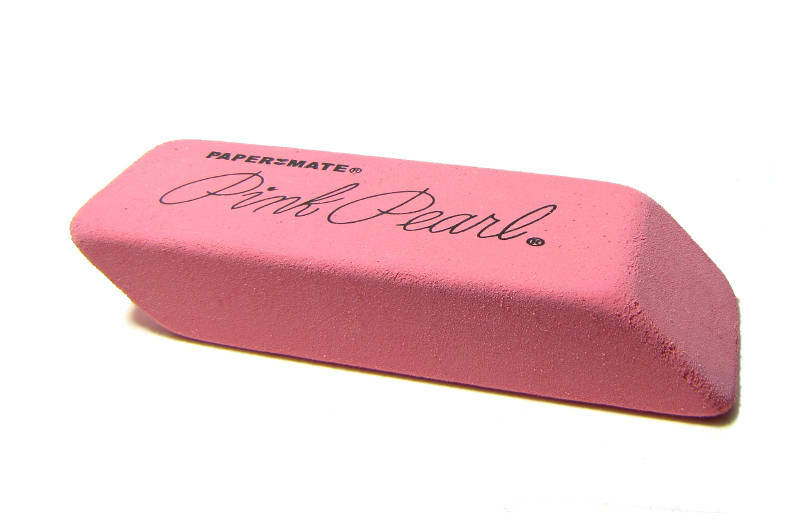 This is a form of deficit spending. 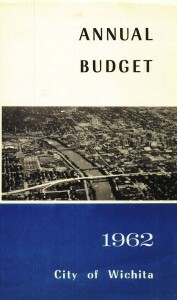 By deferring maintenance of our infrastructure, the city has pushed spending to future years. The report released in February gives an idea of the magnitude of this deferred spending: It’s huge. This form of deficit spending is “off the books” and doesn’t appear in city financial statements. But it’s real, as the mayor now admits. The threat to our freedom to live where we want is real, too. We must be watchful and diligent.